Someone will have to explain to me how this is the least bit comfortable? 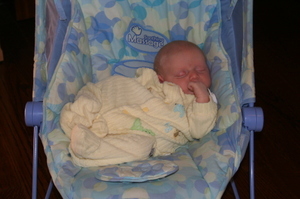 I know babies have no bones but still this does not look the least bit comfortable. 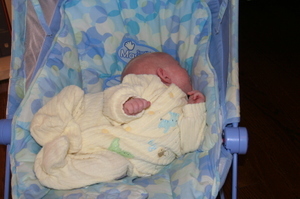 My son slept like this for almost 2 hours today. And if you think that is comfortable this is even worse! Rafi is in the bath and he has a plastic shofar he likes to play with; usually pretending to drill holes in the floor or using it to pour water on the floor. Today he is playing it. Me: What sound does a shofar make? Me: Rafi you know, tekiyah. 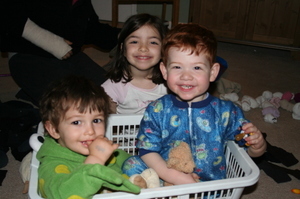 Rafi, Pooh, and Froggie in a laundry basket - April 14, 2007. Rafi and his cousins Sarah and Sam Levin - May 2, 2007. 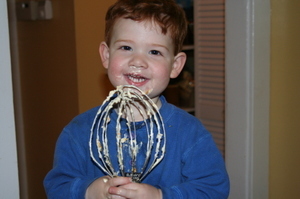 Helping Mommy make Orange Glaze Cake - April 24, 2007. Daddy: Rafi, you and Elan can have baked ziti or felafel for dinner. Which would you like? Rafi: Elan! Do you want baked ziti or felafel or pancakes for dinner? Rafi and Elan: Pancakes! Panackes! Rafi: I'm gonna fill this box up with money for Poppa. Poppa LOOOOOOOVES money!" Rafi: I don't want to wear jeans, Mommy. I want to wear khakis like Daddy. Mommy: Ok, Rafi, let's put on khakis just like Daddy. Rafi: Where are Daddy's khakis? Mommy: You tell me, Rafi - where are they? Rafi: Daddy's khakis are at work with Daddy! Just like Daddy's shoes! Rafi: I'm gonna have mac and cheese for dinner. Mommy: Would you like some peas with that? Rafi: Yes. And you should have some W's with yours, Mommy. I've been letting Brian do the posting duties for a while, so I've got a lot saved up. Tonight we got a bit of blog fodder as Rafi spent some time with his buddy Ilana, who always makes for good stories. The kids (and their parents) went out for dinner tonight and Rafi had two firsts. He experienced bagpipes for the first time and was totally thrilled with them (dinner was at an Irish pub-style restaurant). 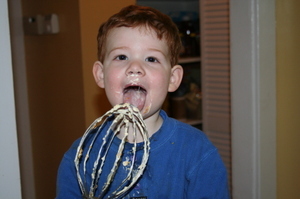 He also got his first French kiss. He and Ilana, egged on by Ilana's daddy Jay, spent part of their time at dinner kissing and licking at each other. Amusing, and a little gross. We'll be reminding them of this sometime in their teen years. - Rafi's been experimenting with language a lot lately. He's playing around with the concepts of "maybe" and "probably" as well as "hope" and " forget." It's interesting to listen to him work these words in to conversation as often as possible so he can see how they function. A typical conversation on the way to school lately sounds like this: "I go to school and see miss Marion. I hope she is there. She probably is there. Maybe Miss Marion is at school." - On the way to school, we've been waylaid recently by construction on our regular route. We're able to take a different route, but we don't dare take it, as we would then miss the variety of construction trucks that Rafi so dearly loves. We see at least one Bobcat, one concrete mixer, and one big red digger truck. Rafi keeps careful track so that he can tell Amanda, who works the front desk at school, exactly what he saw. Thankfully, Amanda is a wonderfully patient and cheerful woman who plays along as if she's never before heard him announce, "I saw I big red digga twuck and a Bobcat and a HONcrete mixah!" (Keep in mind that Amanda gets this litany most days even if we didn't see all of those trucks.) He also makes a point of telling her which trucks were sleeping and which ones were working. The accuracy of the report is very much beside the point. The enthusiasm is the key. - Rafi very much likes the days of the week. He has no idea what they mean, but has taken to using them in place of his usual "yesterday" (meaning any time before now) and "tomorrow" (meaning any time after now). When one of the aforementioned digger trucks was missing one day he declared, "It come back Monday." And tonight, when we were trying to convince him to sing a song for us, he said, "Not now. I sing it Tuesday." - Rafi's also taken lately to telling us how much he loves things (particular books, items of clothing, food, anything) and that certain things are his favorite. - "Thank you" is now a major and unprompted part of the vocabulary. He thnaks us for filling his sippy cup, getting him a snack, putting him in his car seat, and (my personal favorite) he thanked Brian for fixing the banister in our building's hallway, the breakage of which was really bothering him. "Please" is a bit more often gotten by prompting, although he does seem to understand now that if we don't respond to a request right away or affirmatively, "please" can help. - Physically speaking, not much is new. The warmer weather has had us at various playgrounds this week and he is, of course, much better at navigating the equipment than he was six months ago. To Brian's great joy, Rafi can get himself up to the top of the slide and come down on his own and, in fact, insists upon doing so. (To my great joy, he now wants to do all the stairs he encounters by himself, saving my aching back.) He's much more interested in being independent, which manifests itself in all kinds of things, including picking out his own clothes and often insisting on wearing his boots at somewhat less than appropriate times. Rafi: Where'd the grilled cheese go? Brian: You ate it. It's all gone. Brian: It's in your tummy. Rafi: I can't see it! Brian: You need to look for it - it's in your tummy! Rafi: I can't see it! My seat belt is on and my coat is in the way! I have no idea why I found this so funny, but I did. Hope you do too. Mommy: Ok, Rafi, what is it? Rafi: It came from in my nose. It's been a while since we posted! Lots to report, starting with Rafi's two year doc appointment. Dr. Goldstein pronounced him healthy, and measured him in at 29 lbs, 34 inches tall. Needless to say, he steadfastly refused to show off any of his skills for Dr. G, but he did great with his shots, so I'm not complaining. Other cute stuff since we last reported. If you ask Rafi who cuts his hair, he'll say, "the nice lady!" The "lady" is drawn out in classic Jerry Lewis style. When we went to get his hair cut, as I was putting him in the car, he grabbed one of my curls and said "your hair is pretty!" How much do I love that! Rafi is no longer interested in cuddling with us when we sing him to sleep at night. He takes Huntley and Paci and cuddles on the ottoman, then after a round of "Snuggle Puppy," he runs over to the crib to be put in. He is, however, interested in singing Snuggle Puppy to Daddy. Rafi, so far, is unable to carry a tune, and he's not great at lyrics, so it's very energetic and pretty funny. For those who know the song, Rafi's rendition mostly consists of yelling, "OOOOOOO I WUV YOOOOOO!" over and over. Rafi continues his affection for Laurie Berkner. We took him to see her in concert last weekend along with ilana Friedel and her parents. The kids had a blast, especially in climbing the big stairs to get to their seats. Laurie did lots of songs Rafi likes, and he mostly sat on my lap, rapt with attention, dutifully clapping or singing whenever Laurie told him to. Now whenever you mention Laurie, he says "we went to her concert!" Watching his Laurie a few weeks ago, we saw the video for her Goldfish song - a personal favorite. The song involves goldfish doing various things goldfish generally don't do - including taking a shower. I asked Rafi, "do goldfish take showers?" He said "Nooooo" as if I was being very silly. Then he announced, "they take baths!" Rafi helped me cook for the first time tonight. He stood on his step-ladder and helped me mix the baked ziti. A very proud moment for me! He's also been helpful in lots of other ways this week, including helping Daddy shovel snow and helping make the bed for Auntie Jane, who is staying with us tonight. Between all that and the sweeping and mopping, we got the best little helper ever here. I'm sure there's more I'm forgetting, but perhaps it'll spur me to post more often! My son appears to have developed a drawl. Daddy is now pronounced "DAY-dee," there is "THAY-err," back is "BAY-ick" and so on. It's a little odd. It's also pretty cute. Mention the word "birthday" anywhere near Rafi and he will announce, "Birfday comin' up soon. Almost two!" Not sure what he's going to do when the birthday is no longer comin' up but past. 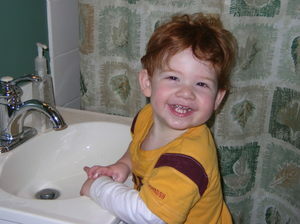 Handwashing is once again the favorite Rafi activity. We've put a stepstool in the bathroom (stepstools being a current object of fascination) and if we let him, he'd wash his hands all day long. We've been through more soap in the last week than we have in the previous year. Chanukah has been a lot of fun this year. There's just such a huge difference between Rafi's understanding and appreciation of the holiday from last year to this one. 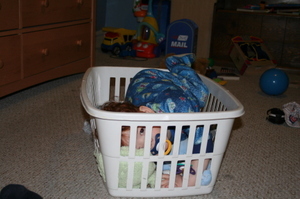 Last year he was 11 months old and had no idea what was going on. This year he's almost two, can sing the blessing over the candles (and starting on night 5, even said "Chanukah" instead of "Shabbat" at the end, wanted Daddy to get a siddur to sing the blessings from, understands and enjoys the whole present thing.... the list goes on. We've had a delightful holiday spending time with various parts of the Shyman-Levin-Nagorsky clan, with Rafi's buddy Elan, and with friends at shul. And someday I'll post photos. In the last week or so, Rafi's become obsessed with DVDs, CDs, and their respective players. He can now work the living room DVD player and his bedroom CD player and constantly wants to swap out CDs and DVDs, even if he (or someone else) is watching them. In the car, he wants us to continually be removing the CDs from the "SEEdee PLAYah" and always wants to hold the case. After all this time, Jack's Big Music Show seems to be on the back burner in favor of the Laurie Berkner DVD, although I suspect that if we regularly watched JBMS on DVD, that would be in heavy rotation as well. Aybee SEEdee Spidah! Duckie E-I-E-I-OOOOOOOOOOOH! There was no tune - just a lot of proud yelling. This was followed by many repetitions (in the bath) of the E-I-E-I-OOOOOOOOOOOH!part. Poor Rafi looked so confused when I doubled over in laughter. I was laughing with him - I was! His musical adventures this week have also included accompanying himself on the guitar singing "The farmer in the dell" (aka "Fahmuh Deh-ooo") and a visit to a local Kelzmer concert by the Maxwell Street Klezmer Band that he really liked. Language development continues. He's still working on the difference between "I" "me" and "my" and probably wil be for some time, but it makes for cute little-kid-speak. He's started to use articles, conjunctions, and prepositions and it makes him a lot easier to understand. We now get full sentences like "Mommy put it on the table" and "Me no like take a bath."